DCNS has been awarded a contract by the Norwegian Defense Logistics Organisation (NDLO) to provide support for the Senit 2000 combat management system (CMS), which is equipped onboard six Royal Norwegian Navy’s Skjold Fast Patrol Boats (FPBs). Under the agreement, the company will deliver technical support activities that will involve providing through life support, maintenance and further development of the CMS. NDLO naval systems chief commodore Geir Kilhus said that the complex and technologically challenging project would form the basis for supporting the CMS on Skjold-class corvettes. "The scope of this four-year contract is the frontrunner for lifetime support of the Skjold-class weapon-system," Kilhus said. "The scope of this four-year contract is the frontrunner for lifetime support of the Skjold-class weapon-system." Led by the Skjold prime consortium, the programme will consist of DCNS serving as the combat system design authority and co-supplier, along with two undisclosed Norwegian contractors. Senit 2000 is a multi-role integrated combat system that incorporates advanced technologies to suit modern day operational warfare requirements in demanding environments. Capable of being operated by a limited crew, the system’s fully compatible communications and sensor suites enable active participation during international and Nato-led operations. Designed to perform maritime security and safety missions in Norway’s littoral waters, the 50m-long Skjold corvettes are armed with eight anti-ship missiles and a 76mm gun to be able to engage various targets at a time with ranges in excess of 12km. The Norwegian Navy has already received four of the boats, P961-Storm, P962-Skudd, P963-Steil and P964-Glimt, while the remaining two will be delivered before 2013. 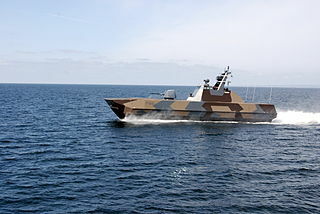 Image: Port side view of the first Norwegian guided missile patrol craft, Storm. Photo: courtesy of Matt.